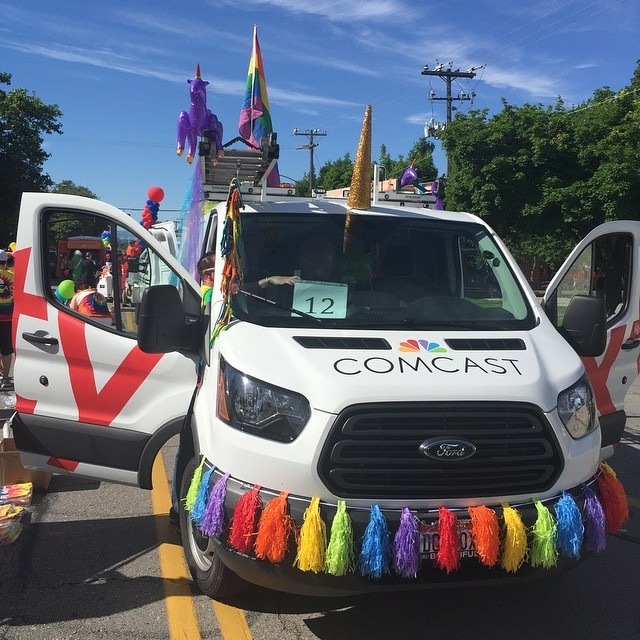 Outfitted with unicorns and streamers on Sunday morning, a Comcast van was driven in the 2015 Utah Pride Festival Parade Sunday morning with Comcast employees, family and friends walking alongside. “At Comcast we act and feel like one big family. The opportunity to support our community and Comcast family was a privilege for me to be involved in,” said Yvonne Honican, Manager, Retail Sales. Sunday marked the first time in Mountain Region history that Comcast participated in the parade. Comcast’s theme was “Love is OUT at Comcast,” which participants donned on tie-dyed shirts. Participants recall an onlooker shouting, “I love Comcast!” Comcast giveaways such as temporary tattoos, stickers and wristbands were popular with the crowd. Thank you to everyone who organized and supported the Comcast parade float – we look forward to seeing you again next year!